Have you ever imagined yourself with a giraffe-like neck? Tentacles instead of arms? Maybe the lower torso of a preying mantis? If you have, great French space artist Lucian Rudaux beat you to it, creating bizarre illustrations of what humans might look like if "evolution had taken a different turn." When I last wrote about Rudaux, I mentioned that he spent a lot of time illustrating articles about science for popular magazines. Many of those were reprinted in this country in the Sunday newspaper supplement American Weekly. In a 1938 series written by his close friend, Professor Rene Thevenin, Redaux created this series of illustrations depicting humans with various attributes from the animal kingdom. Thevenin and Rudaux envied the abilities of animals fly or live underwater, though they admitted, "we can console ourselves by saying that these additions —if we had them —wouldn't add much to our general attractiveness." Electric-Men generating current like electric eels would be "formidable enemies." "Firefly Men would always have light, which would be produced as a cell secretion like fat or perspiration. Theoretically there is nothing to prevent men from producing light; it would be very useful, too." Thevenin and Rudaux were ahead of their time with that one, since it was recently discovered that humans already have a natural bioluminescence. We might have Fish-Men if the world were to become inundated. "Man's looks wouldn't be improved any with fish gills," Thevenin admitted, but adds that they'd be handy at the bottom of the sea. 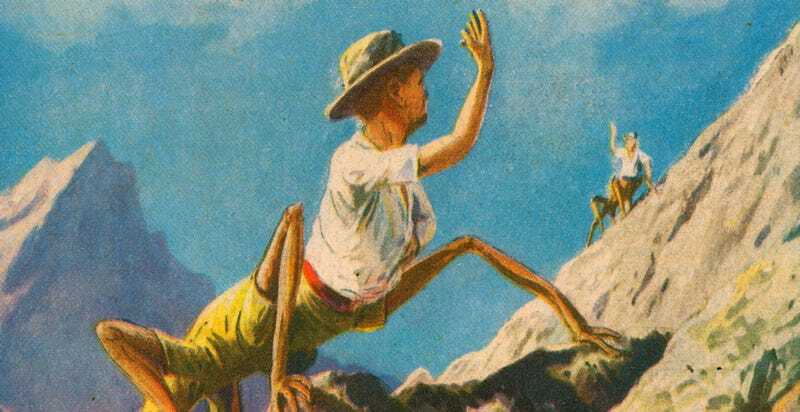 Insect-Men might have six or eight legs, which would make them good guides and mountain climber, "but with twenty or fifty pairs of legs, like some centipedes have, would probably be a nuisance." An Octopus-Man would make a fine policeman or soldier, says Thevenin, because "it would be useless to try to escape from them."